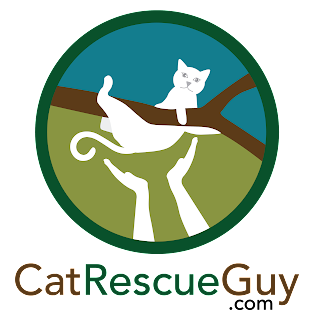 When I get a call for a rescue, I love it when I hear the caller say that their cat loves people, including strangers. I did not hear that this time. 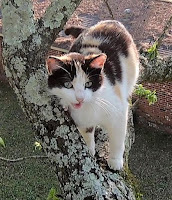 In fact, Pamela told me that her cat, Skylar, an eight-month-old calico girl that was raised in her home since birth, does not like strangers. The encouraging news, however, was that it would likely be possible to make friends with her in time. So, off I went to rescue Skylar knowing in advance that I would need to be patient with her in order to gain her trust and cooperation. Skylar was only 25 feet high in a large, easy-to-climb sweet gum tree, and she was resting about 10 feet out on a long limb. What concerned me was that her limb was directly above two fences -- one wooden, one chain link -- that ran in parallel to each other a few inches apart and along the same direction as the outer part of the limb. The fences would be a serious risk to her if she fell, so I wanted to be sure I did not give her any reason to be afraid of me. 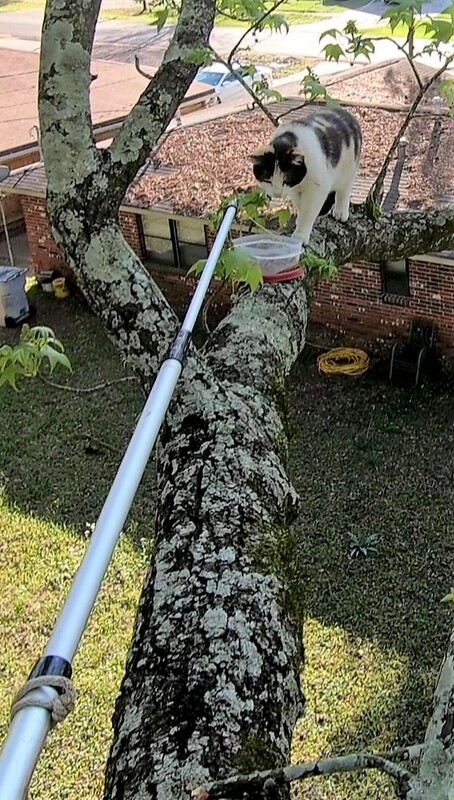 If she went out to the end of the limb where her footing would be less secure, she could possibly fall onto the fences below. 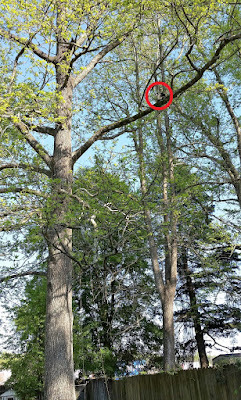 I easily installed my rope in the tree without disturbing Skylar and climbed up along the trunk of the tree to her limb. She watched me as I reached her height and remained calm and in place. So far, so good. I spoke to her and reached my hand out to her, but she had no response to that. 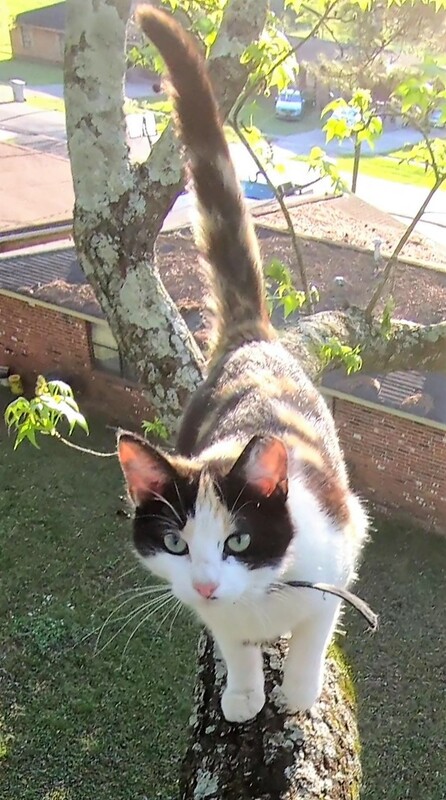 I spent a few minutes with her there hoping she would just miraculously walk along the limb to me, but, of course, that miracle didn't happen. I opened a can of food and showed it to her. No response. In fact, I was having trouble getting her attention. She either would not look in my direction or she would lie down and close her eyes as if to sleep. I put the food on the end of an extendable pole and placed it close to her. Now, I was getting her attention. She looked at it, sniffed the air and decided this was worth investigating. She stepped up to the food and sniffed again. She took a bite and seemed to like it. Now, I was feeling confident that I could lure her closer and closer to me and get this little girl down, but each time I pulled the food a few inches farther away, she refused to go closer to it. In fact, she seemed to have the opposite reaction: she turned around and walked farther away. After a few minutes, she came back to her favorite spot on the limb, and we started this dance all over again, each time with the same result. Up to this point, I had been hanging by my rope level with her limb, because I was reluctant to get higher and appear more imposing or threatening to her. 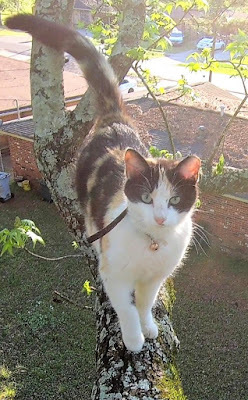 But now it was necessary to get up on her limb and go out a little farther toward her. 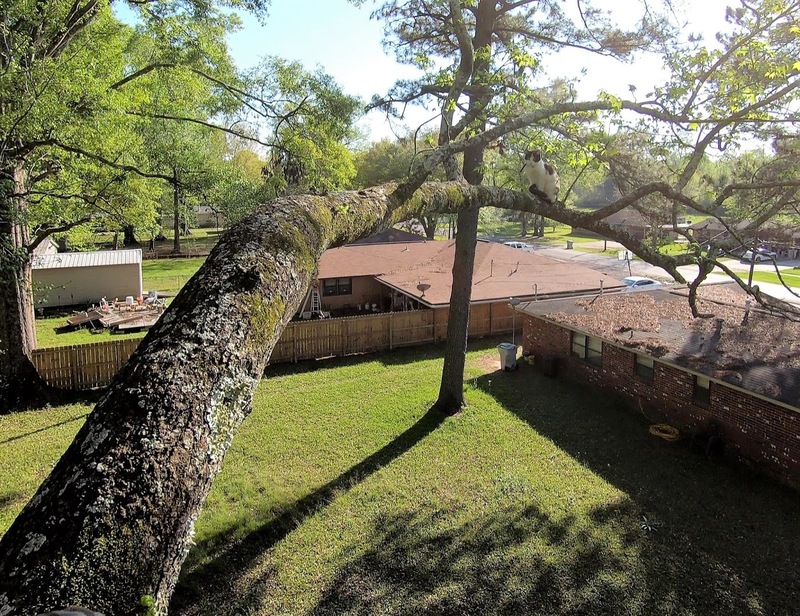 If I had stood up on her limb, I would have towered over her, and she may have felt more intimidated by that. So, instead, I pulled myself up to her limb and sat on it. She did not seemed to be bothered by that. I gradually worked my way out toward her and tried the food bribe again, but, again, I had the same result. She liked and wanted the food, but she would not come closer to me. She got back in her sleeping position again, so I decided to just be patient and appear uninterested in her to give her time to learn to trust me better. More time passed, and I was still not making any progress with her. I could have stood up and gone much farther out her limb toward her, but I was afraid that she would go out to the end of the limb and fall on the fences below. I wanted to be safe and just wait for her to come around. I called Pamela and asked her to talk to Skylar through my speakerphone to see if Skylar would respond to her voice. That failed too. It wasn't until Pamela came out into the yard and began calling and pleading with Skylar to come to her, that Skylar finally began to wake up and show some improvement. Skylar called out to her and walked closer to me, but still stopped short of me. I held the food out for her, and she would take steps toward it, but she was still reluctant to come all the way. She rubbed her head on the limb several times while thinking about it and walked a little closer to me. Again, she stopped short, turned around and went back out. We played this routine several times, each time getting a little closer to me, before she finally found the courage to actually sniff the food again. 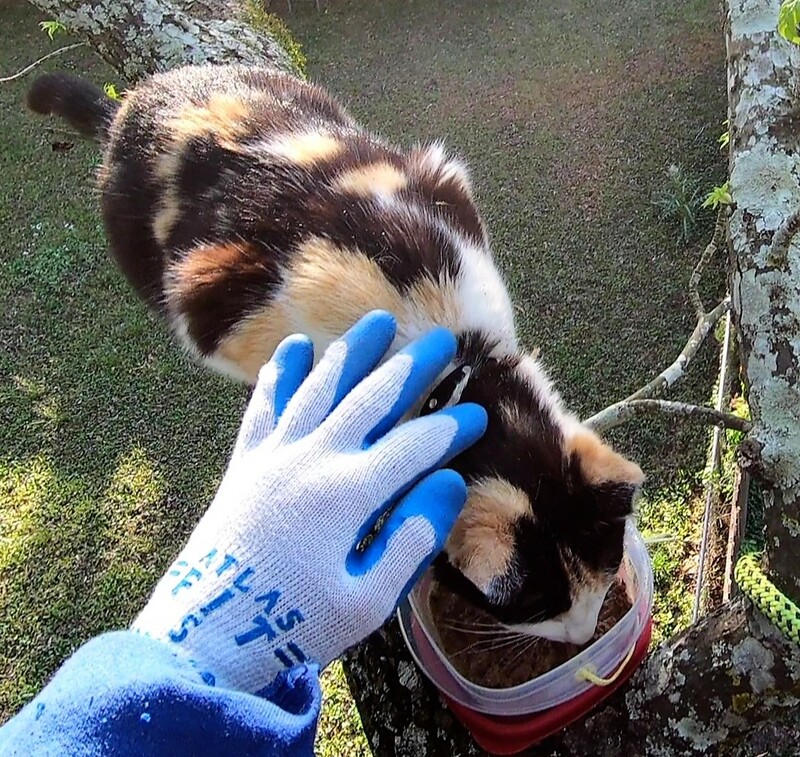 She seemed okay with my hand holding the food, but each time I reached my hand closer to her, she backed away. I let her have some more bites of food, and, each time, I tried to touch her. She did not like for me to touch her and pulled away each time, but after doing this several times, she reluctantly tolerated it enough to let me pet her gently while she ate. The first time I had a chance to grab her scruff, I took it and gently lifted her while pulling the bag over her. She did not complain or struggle one bit. I brought her down and gave her to Pamela. She took Skylar, still in the bag, inside the house to release her there. After I packed up, I carried my gear back to the truck and passed very closely by Skylar while she was eating. She was intent on eating and did not let my presence interrupt her. She was a tough cookie to rescue and made this rescue take far too much time, but she is down now and doing well, and that is what matters.